I have this problem that I tend to be an eternal optimist. There are exceptions to this fact, such as when I fear running out of food, my optimism tends to fade, as well as when I’m suffering from the hangries, but all in all, I’d say that I trend more towards finding the good in everything rather than the bad. The problem with this: I tend to find some things ridiculously fun and good that other people find, well, dumb. When work obligations forced a return to Boulder for sub-72 hours before our predicted departure for Camp Lynda, I was a little worried. 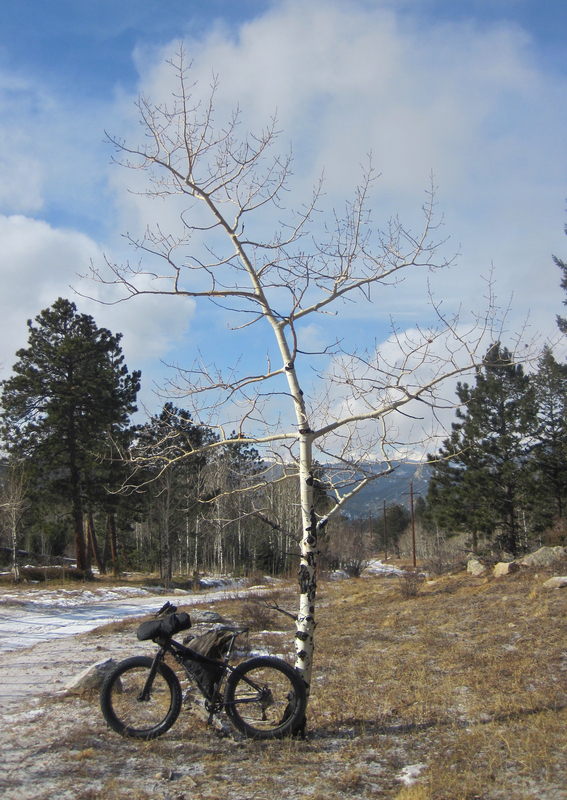 Winter Park had delivered in terms of riding, but Boulder…well, Boulder has a bit of a reputation for lacking mountain bike access. 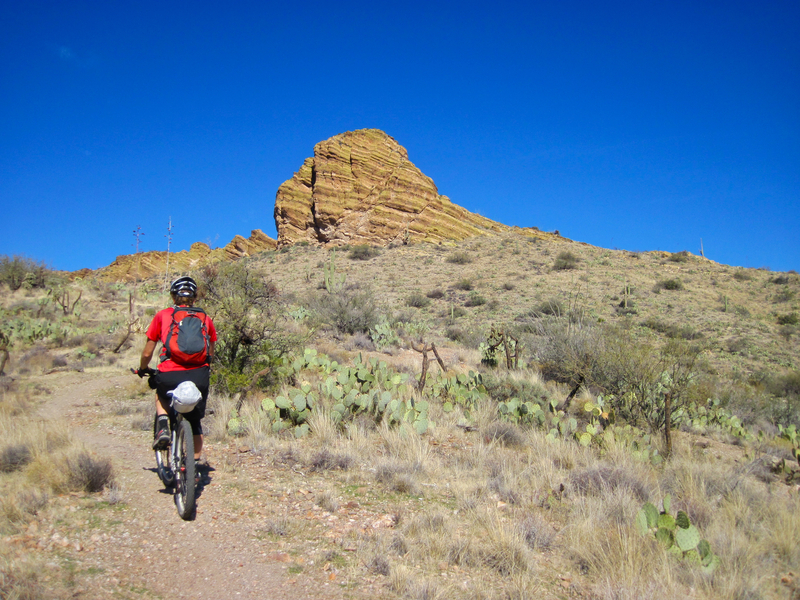 With four trails in the vicinity, I was worried about showing my riding routes and trails to someone who has miles upon miles upon miles of Tucson trails to access. I was worried because just because I love my routes and limited numbers of trails, doesn’t mean they’re actually any good. Just because I love Heil Ranch on every bike I’ve ever ridden it on, from my rigid singlespeed to my dually, doesn’t mean it’s a good trail. I’ve heard my fair share of complaints about it. Rocky. Lacking flow. Not steep enough. But with only a couple of hours in the morning before ‘work’, we went. 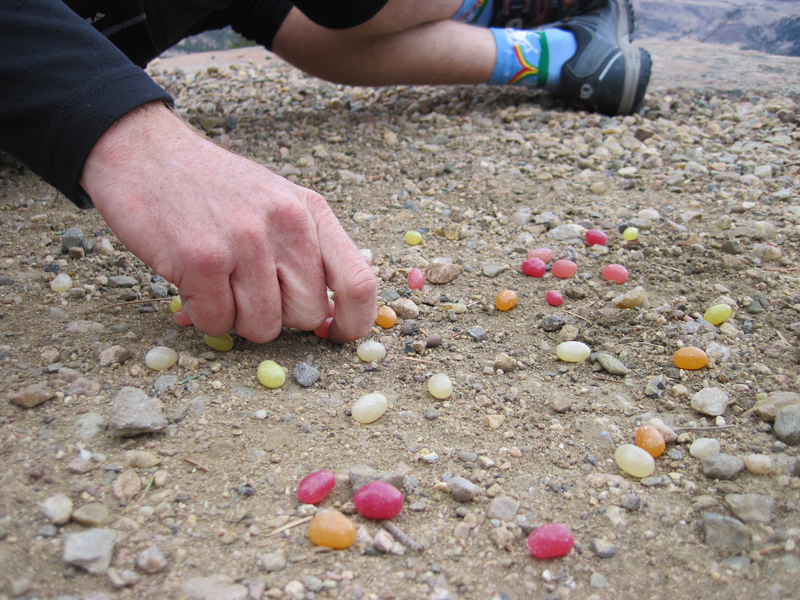 By the time I dropped all the jelly beans at the overlook, I knew my fears were, once again, unfounded. Am I seeing a pattern here? The trail really is as fun as I think it is. No, it’s not epic. It’s not gnarly. It’s not even that long. But for a two hour ride, it’s pretty perfect. And I even made it to work on time! Well, almost, as the optimist in me overestimated my overall pedaling speed through town. And then we had to bail on Camp Lynda due to a deteriorating weather forecast. 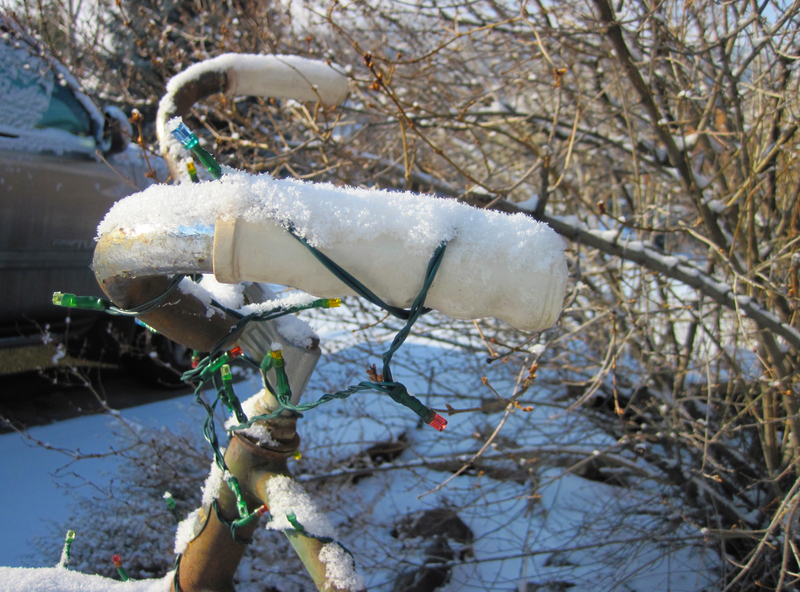 I may be optimistic, but I’ve done St. George in bad weather, and it did not treat me well. So Thursday morning, we made the call to stay local instead, which meant I had the job of coming up with a ride for Friday. Clearly, it had to go to the Ned Co-Op because if there’s one thing that I post more pictures of on this blog than my bike, it’s goodies from the Co-Op. But what if the scones/muffins/cupcakes from the Co-op weren’t actually as good as I imagined them? Now that, my friends, is a silly question. Of course they’re really that good! And the ride up there? 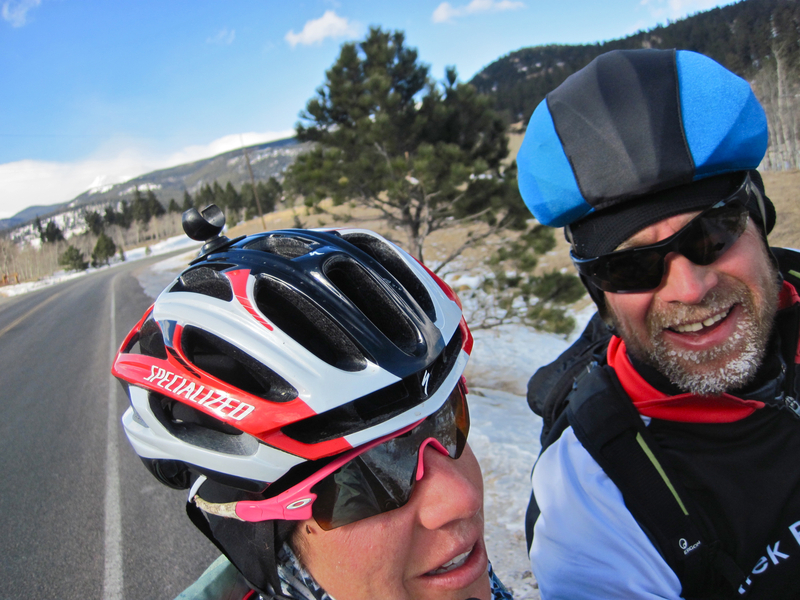 Well, for the record, I did tell Scott that we were going to climb a bunch, to bring warm clothes, and really, he should know by now that I’m not kidding. 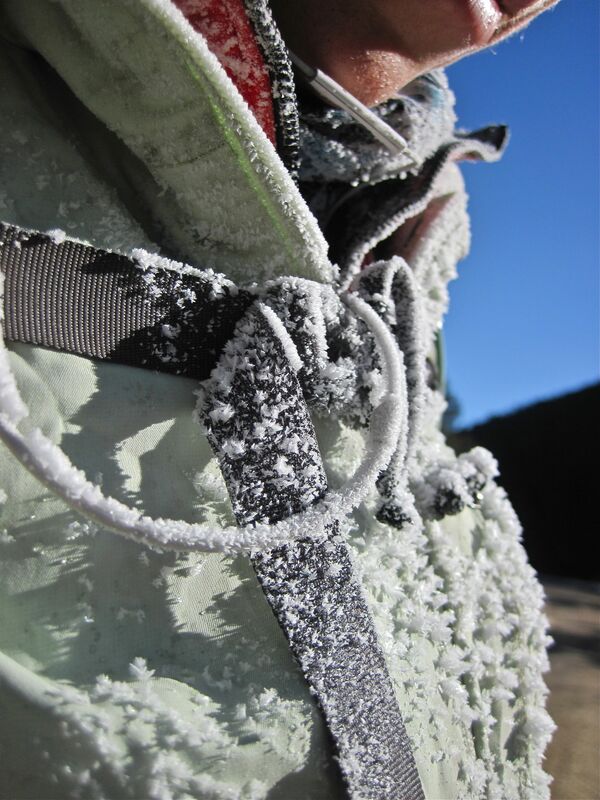 I was downright giddy by the time we hit Peak-2-Peak with the temperatures a solid 20 degrees warmer than they’d been a week prior when I’d struggled to stay warm and I had a hard time containing my excitement of how beautiful the weather was. Balmy! Sunny! Only psuedo-windy! Sub-freezing temperatures at 9,000 feet in Colorado with a solid, frigid breeze and I thought it was the best weather EVER. Optimism: distorting reality one skewed viewpoint at a time. The ride really was that delightful. 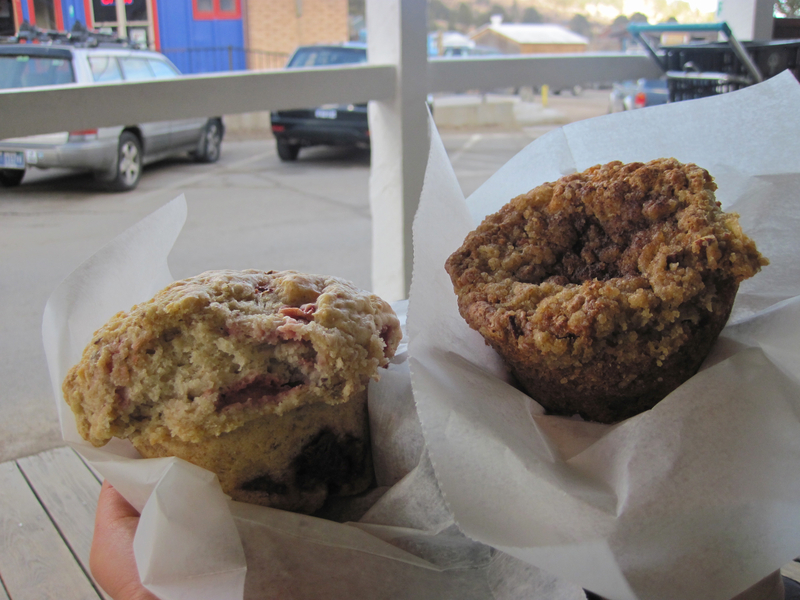 The muffin and coffee cake were really that good. 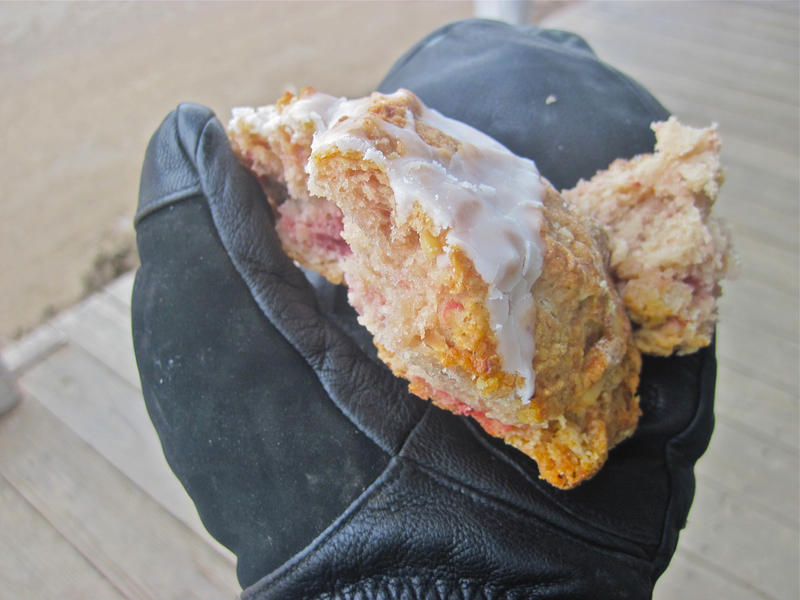 And the extra coffee cake that Scott had the foresight to buy for the weekend’s adventure was just more proof that maybe my life viewpoint really isn’t that distorted at all. There was a period of time not too long ago that I wanted a Life Instruction Manual. I wanted someone to tell me what to do and what was going to happen. I dreaded the unknown of the future, of truly being unable to imagine what was going to happen next. I talked of a real job, of stability, of shelving the wild streak, the wanderlust, the lack of moderation, at least for a little while. 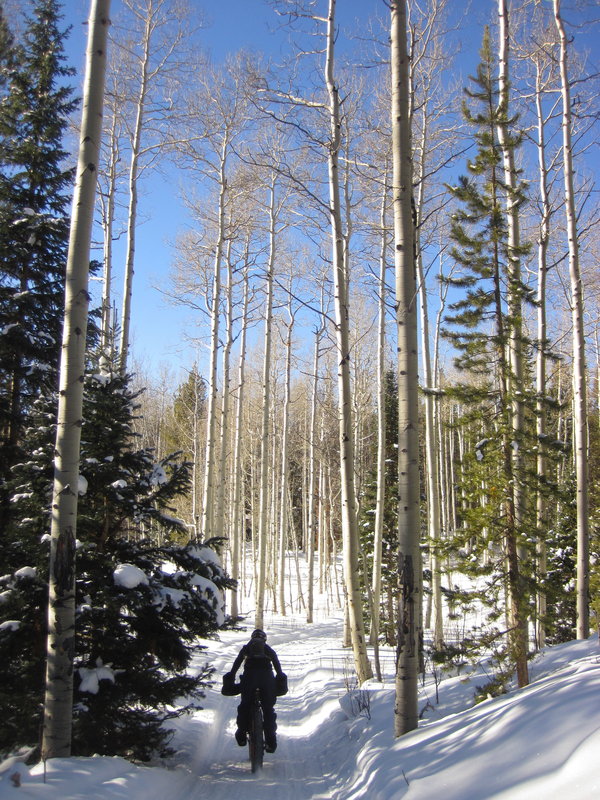 Then I took a flying leap of faith and found myself in AZ on Christmas. And everything changed. A similar flying leap was taken last week and I found myself with a boy and his clown bike on my doorstep. A boy who, for the record, is the definition of a desert rat, who wears knee warmers when it’s 70 degrees out, and has a reputation for disliking the cold about as much as I dislike fixing flat tires, which is to say, a lot. They look skeptical of each other. 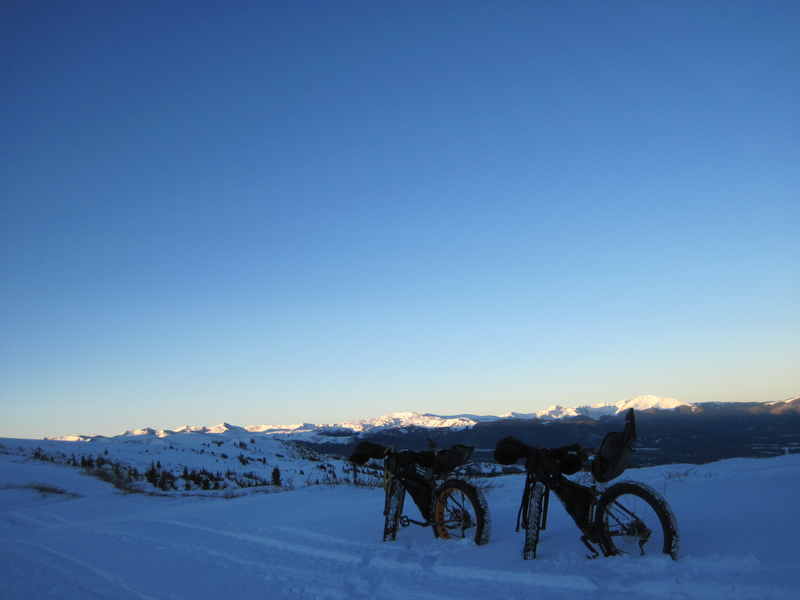 So we did the only logical, rational thing that we could do: We headed up to Winter Park to ride the Monster Truck Ponies with the only certainty of ‘Something is going to happen.’ I had no idea of the snow conditions, I had no idea if trails would be rideable, I had fears of our planned overnighter being executed entirely on dirt because many of the CO mountains haven’t exactly been graced by snow yet this winter. Something was going to happen. And, as she’s been seeming to do in abundance for the past few months, the Universe smiled. Day 1 brought an eye-opening exploration of the backyard trails, all moderately well packed from skier traffic and delightful to ride. After hours of wandering the trails where I first really learned how to mountain bike on dirt, I breathed a sigh of relief. Another leap of faith had been generously rewarded. My worst case scenario fears of the unknown replaced by exclamations of giddiness, joy, exuberance. Could these trails really be this good? Day 2 brought more of the same with the added excursion towards Tipperary, part of the King of the Rockies race course. 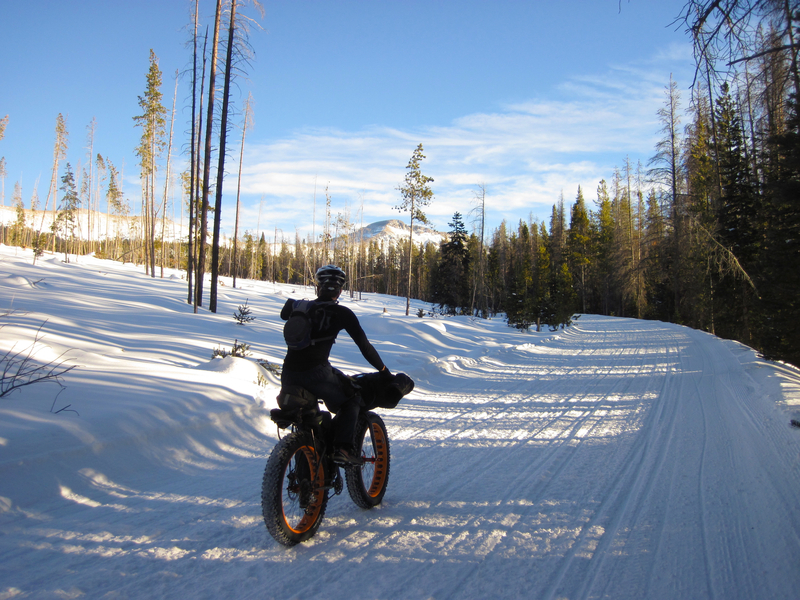 Conditions went from well packed and rideable, to marginally rideable, to pushable, to marginally pushable, and then to ‘This is dumb. 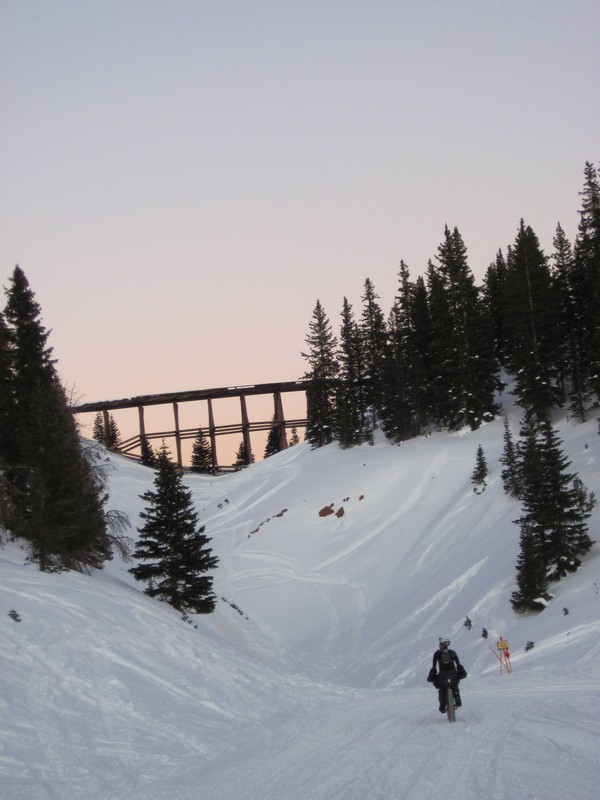 I bet descending what we came up would be a lot of fun.’ And so we did, and what is a wicked fast descent down Spruce Creek in the summer proved to be similarly adrenaline-inducing in the winter. Win. 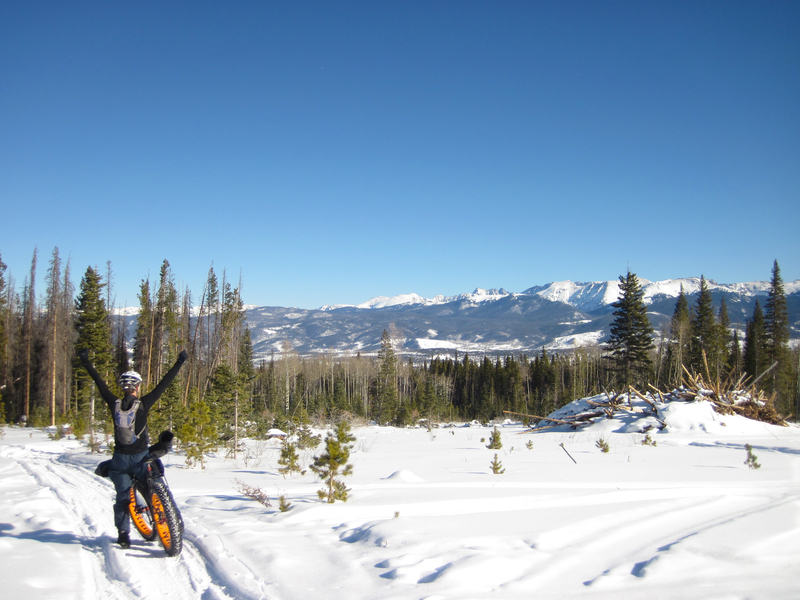 With the warmup rides done, snowbike handling skills improving, we proceeded to the ‘reason’ we were spending time in Winter Park. 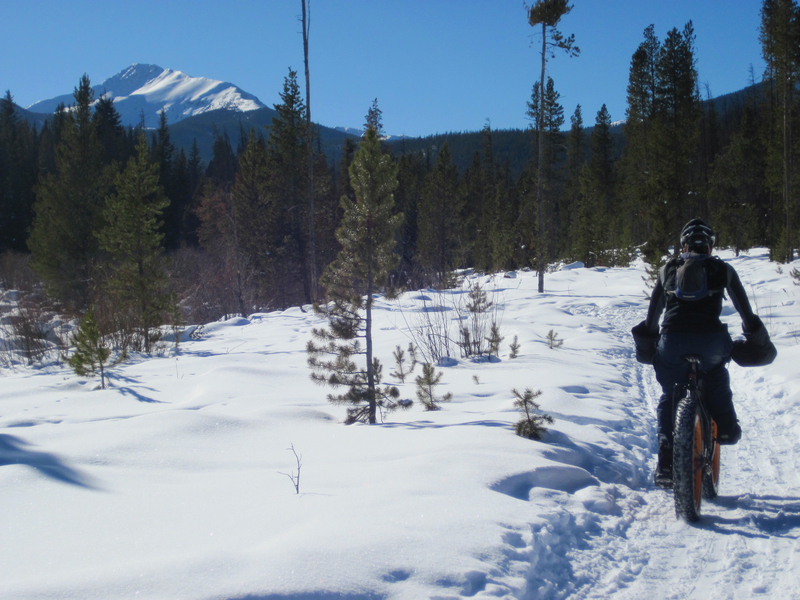 Snowbike bikepacking. Would AK actually be survivable if I had to spend the night out on the ITI? 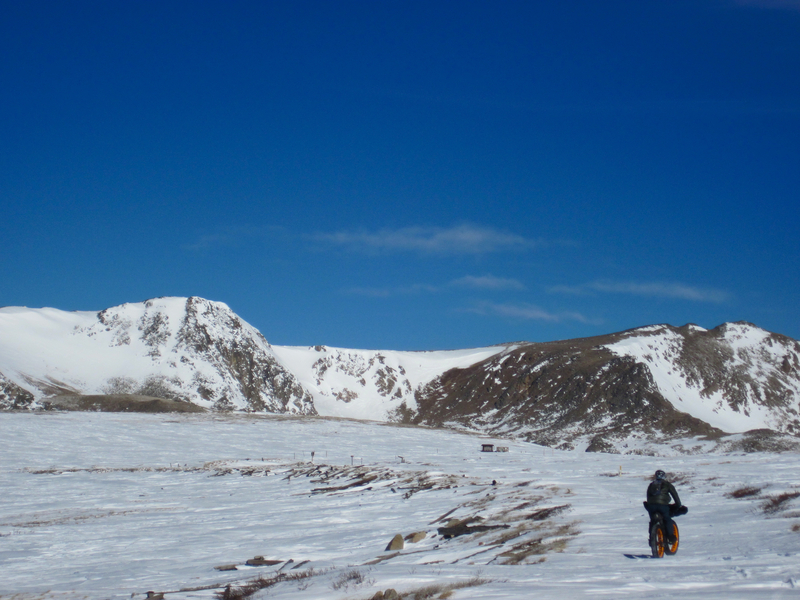 I’d camped on ski trips in the spring before, surviving freezing nights in a 30 degree sleeping bag, but somehow a full on winter camping trip seemed infinitely more intimidating, even with a -20 degree sleeping bag. 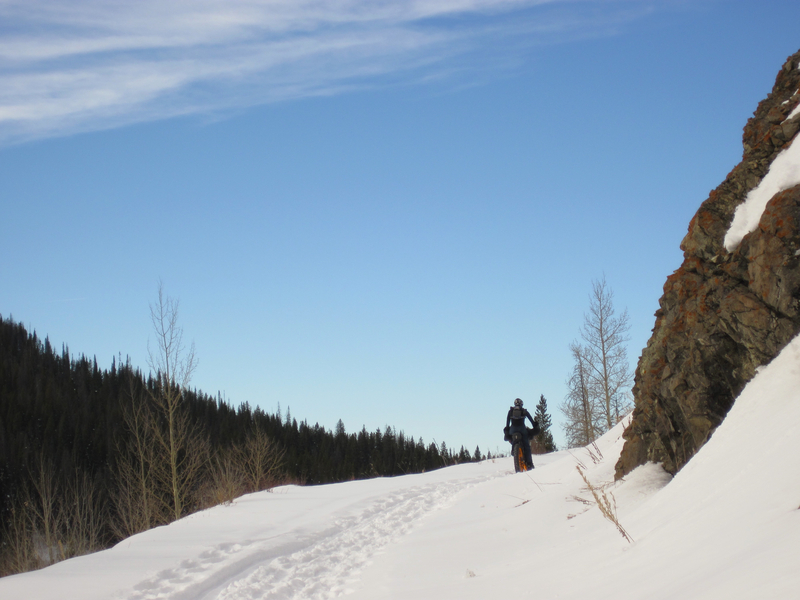 Maybe it had something to do with the fact that there was rarely a spring ski trip overnighter where I wasn’t freezing the entire time…confidence of warmth was not high. I could write about what happened, but really, Scott did a pretty stellar job of that already, so I’ll pass on it. But now, over a week later, what really is proving to be the sticky point of the whole experience was with the ease that the unknown was handled. Going from a pile of gear on the floor to a pile of gear on the bike. 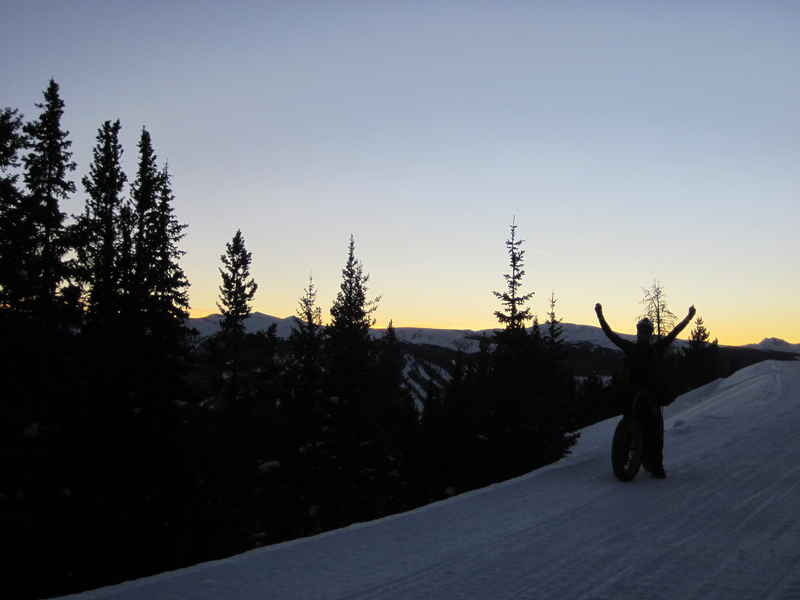 From the comfortable sunny condo in Winter Park to near the top of Rollins Pass at 11,500 feet as the sun was casting it’s final rays. Transforming from chilled when we first stopped for the night to realizing that -20 degree sleeping bags are nothing short of amazing. 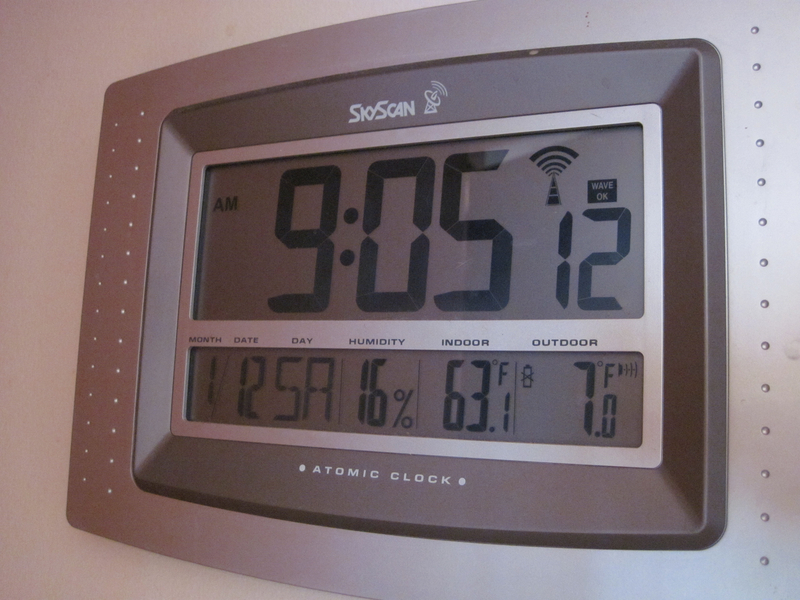 To figuring out a dozen little things that I didn’t even know I didn’t know in terms of temperature management. 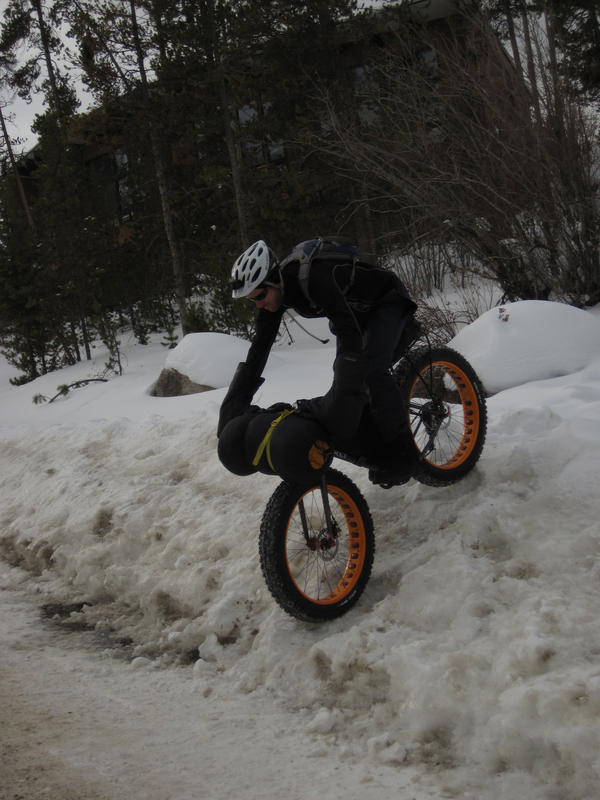 Learning that clownbikes really can handle an amazing variety of snow conditions. There was an ease to it. An ease to facing the unknown with grace. And we were rewarded. By being right there. Right then. I still have no idea what the rest of ‘life’ will look like, but the leaps of faith seem to be working out for me, each new one better than the last. The Universe is smiling. I had two conversations with people from my past today. The first, a physics professor who I’d taken classes from as an undergrad who was also a bike rider (and also happens to be teaching the class that I’m TA’ing for). The second conversation, with the lovely Mara who’s reach back in my life stretches to swimming days and then a series of frequent and not-so-frequent life intersections as we’ve both navigated school, bikes, and yoga. The first conversation started as many of my Boulder conversations start: Where have you been, what have you been doing? Those are easy questions to answer. Then the inevitable: What are you doing now? After having been asked this question countless times, you’d think I’d have a prepackaged answer, but I don’t, so I stumble. I almost had myself convinced. After normal pleasantries such as, ‘What brought you back to Boulder?’ to which I could only laugh, we started talking life, and between the two of us, we had some good life to talk about. I told her how I was living under the story of going back to school to do something useful and steady with my life, but really, if I could pull it off, I had every intention of spending summer in Durango and then hightailing it down to Tucson for next winter. I wanted to put an honest effort into my current writing project (calling it a ‘book’ still intimidates me, so we’ll call it a project), I wanted to drum up some more high paying teaching work, I wanted to ride my bike, and not just in an after-work manner. Telling this story brought much more of a smile to my face than the story I’d told earlier in the day of heading along the path of a ‘real’ job. I told her the truth about the major flaw in my teaching-as-a-real-job plan: There’s a little race in New Zealand next February that I really want to do, and if I’m going to procure the Ambien to fly all the way to New Zealand, I want to spend at least a month there. I can’t do that with a teaching job. We talked about assessing our talents, about our inabilities to settle for anything less than the best we can do, and trying to piece together the many pieces called life in a sustainable manner. Code cracking, if you will. We’ve both found ourselves with a reset button pushed. We both get to choose where we go from here. I, for one, can’t wait to see where Mara takes her story (but secretly I’m hoping that her story and my brother’s story intersect in 2016 so I can go visit Rio). And at the same time, I’m remembering that I’m the author of my own story. My life. Right now. 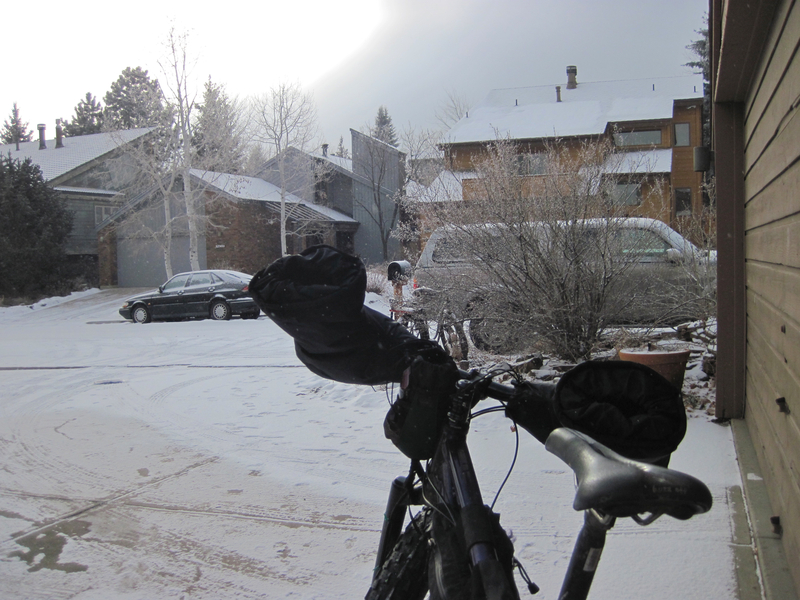 I finished my ride yesterday, which was technically colder than my ride on Saturday, relatively warm. 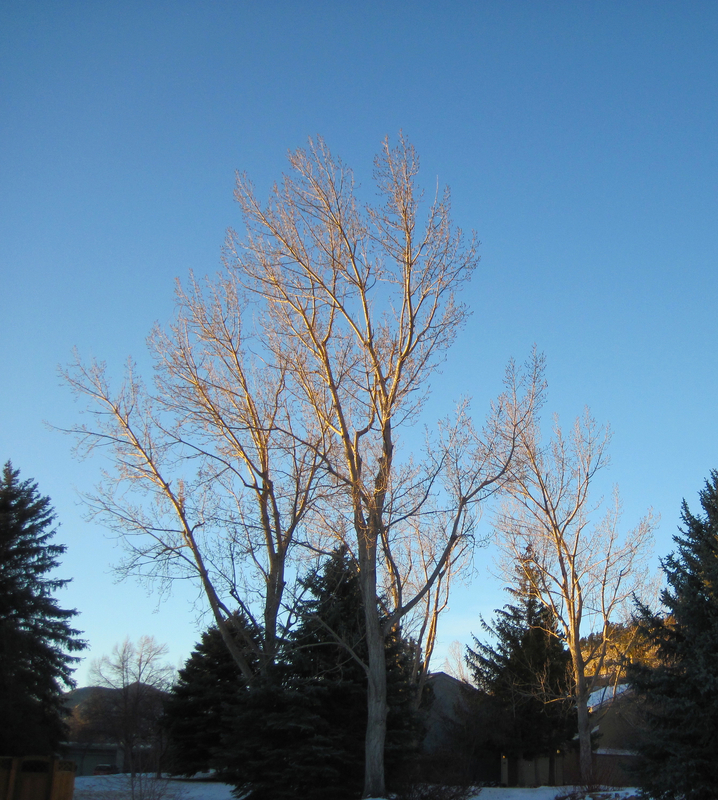 I won’t say warm, or comfortable, but compared to Saturday, it was relatively warm. I could immediately unbuckle my helmet and take my pack off. I could make a cup of hot tea. This was a step in the right direction as compared to Saturday’s state. Not perfect, by any stretch of the imagination, but one step towards feeling like I’d be able to survive Alaska. 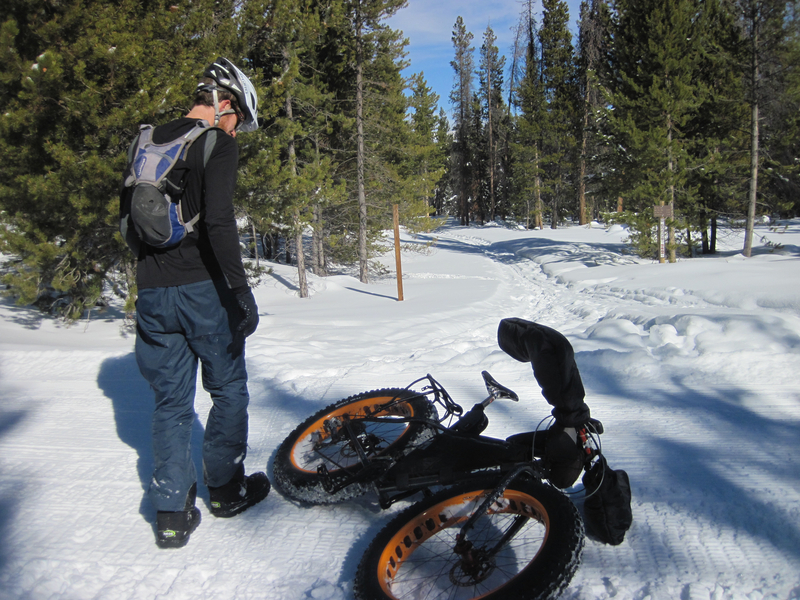 To an outside observer, my ride on Saturday was somewhat of a disaster. I got home frozen. It took me a solid 15 minutes to regain the dexterity in my fingers to take my pack off, let alone my helmet. Somehow I managed to walk into the house as my mom was on Skype with my dad so she got to see me in my full frozen glory. She questioned my sanity. She questioned my leap of faith to sign up for the Iditabike. Three years ago, she questioned my move to CeeBee. When I came back from CeeBee, she asked me what I’d learned from the experience. What did I learn? I learned that I’m blessed with an amazing body and mind ready to soak up the human experience, the good and the bad. I learned that not everybody in this world has to lead a life according to ‘normal’ conventions. I learned that I like to find the limits in everything. I learned that there’s nothing I like more than getting to wake up to watching sunrises and go to sleep watching sunsets. I learned that I can live out of my car and be perfectly content. I learned that even when things got really hard, I could still find happiness in beauty and in life, and when things got really bad, I could be brave enough to change my situation. I learned that if I keep throwing myself at life with full force, I could keep landing on my feet. I learned that I’m really just not a huge fan of the cold. I learned that what others viewed as a disaster, I viewed as life. What did I learn from my ride on Saturday? Don’t take my gloves off. Keep eating. Keep drinking. Cover my face on the descent. Put my jacket on and if I’m sweating in it, slow down. On Sunday, I threw myself at another ride in single digits. Back up to Ned. I used what I learned. And aside from slightly chilled hands, I was okay. I was happy. Show up. Screw up. Grow. Learn. Show up again. 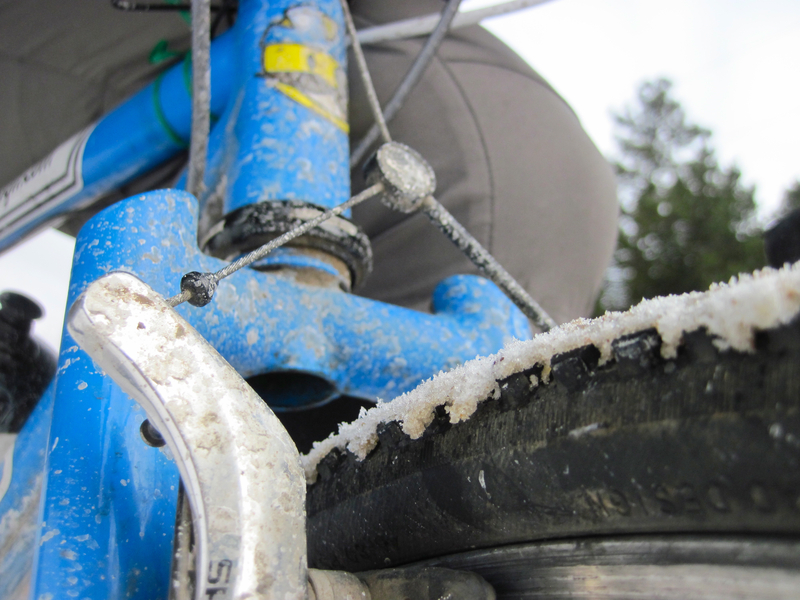 I made a fairly significant cold-weather riding blunder yesterday. Two of them, actually, in a row which compounded to lead to a very cold Ez. The first one could almost be excusable. After doing my LW Coaching prescribed workout, I found myself up at the Ned Co-op, home of flourless chocolate cupcakes. 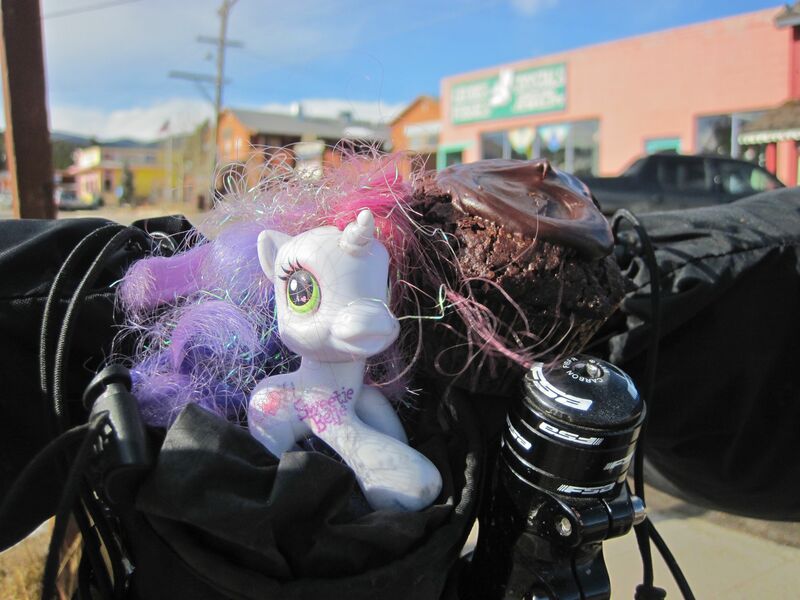 I’d been dreaming of said cupcake for the entire ride, so I went in, purchased the Embodiment of Happiness, and savored ever last moist chocolately bite, saving the frosting for last. 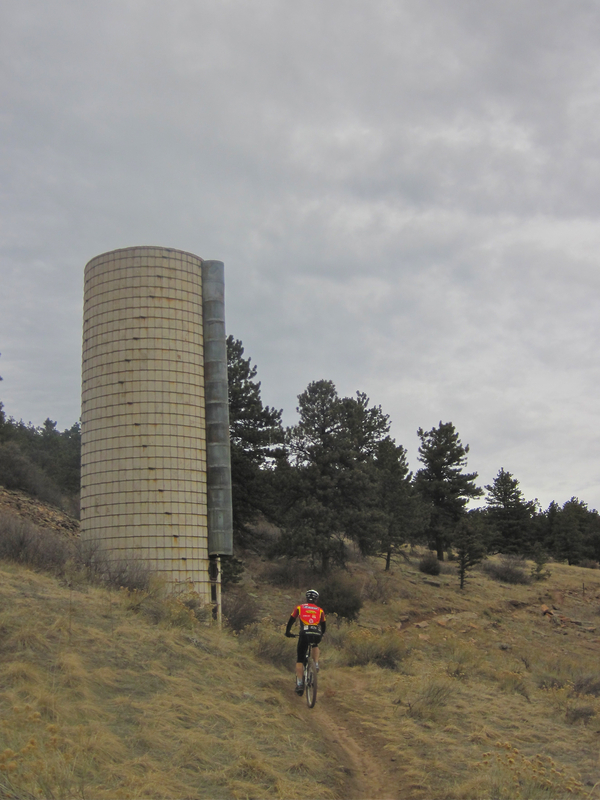 Then I pointed my bike towards home via Sugarloaf, which for those not bike riders in the Boulder area, requires a climb out of Ned, a descent, another climb, a long descent, another climb, and then an even longer descent into Boulder city limits where it’s all uphill home for me. All the uphills are significant (5-10 minutes long), and I’d reasoned that I’d stop and swap sweaty gloves out for dry ones and put my down jacket on at the top of the second climb, before the downhill got significant (longer than 5 minutes). I didn’t want to get my dry clothes even remotely sweaty. What I’ve failed to mention here is that it was 7 degrees out when I left the house, 11 when I got up to Ned. It was not a warm day out. I climbed happily out of Ned and paused, mentally at least, at the top of the hill and pondered doing the clothing swap there. ‘Nah,’ I convinced myself. ‘This down isn’t that big, the the first Sugarloaf climb will make you sweat.’ So down I went, sub-warm. And then I ran into JD riding in the opposite direction. Wanting to document the moment for LW, just to show her that she really did pick some crazies to coach for 2013, we stopped, I pulled off my sweaty gloves, and we futzed around trying to take a picture of Tweedle-dee and Tweedle-dum. Plus, JD had an awesome ice goatee going. 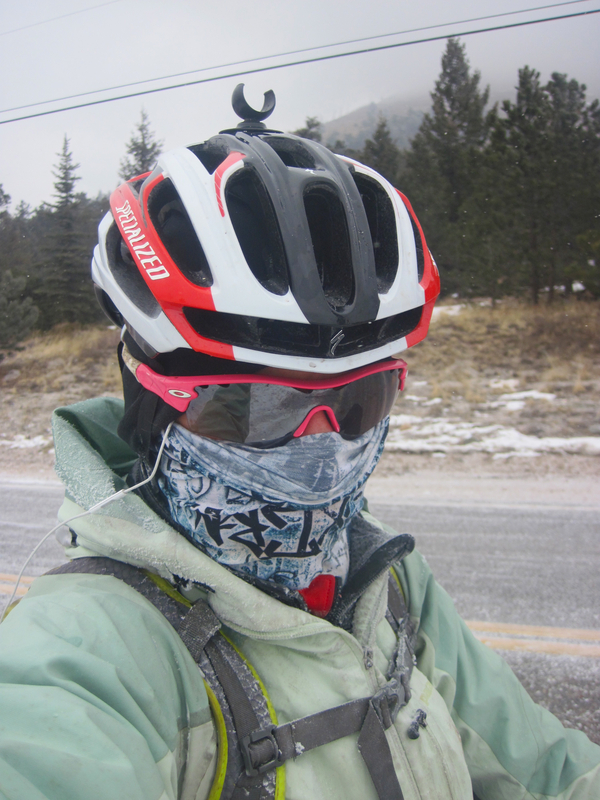 Eventually, JD pedaled off and I decided to do my glove/jacket switch only to find that I’d completely lost my hands. 11 degrees, damp hands, Peak to Peak wind. Go figure. ‘Well, crud,’ I thought to myself, looking at my fingers which were completely useless. How am I going to get my shell off, my down jacket on and zipped up, shell back on and zipped up, gloves on, and then back into pogies? I guess this is why we practice things we want to be able to do. Practice riding bikes, practice dealing with the cold, practice in life. So I took a deep breath, shoved my hands under my armpits (I would have gone with down my pants, but I was in a semi-populated area), told myself ‘You’re going to be okay’ and proceeded to undress and redress myself using a combination of teeth and frozen fingers. 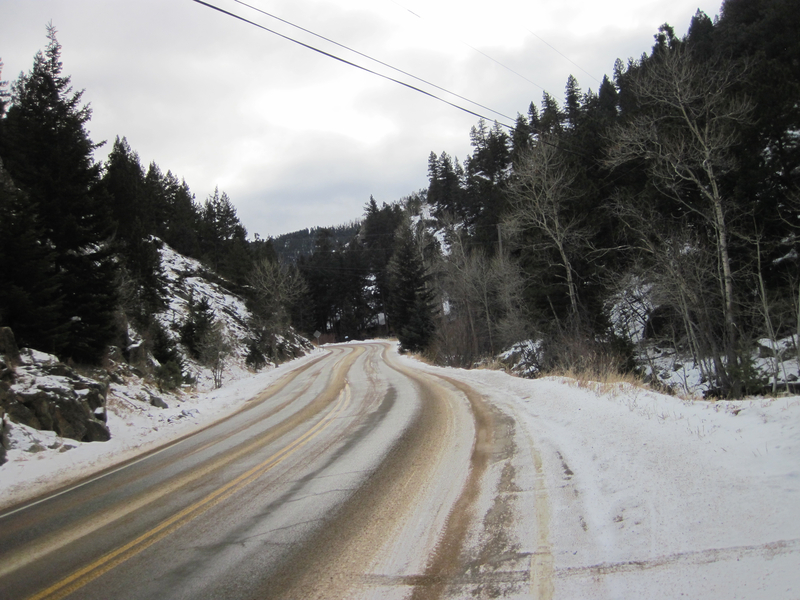 I wiggled my down-gloved hands back into my pogies and started uphill. By the top, circulation had returned, I could feel a slight bit of sweat building, the sun was shining, and I only had 3,000 feet of downhill, straight into an inversion to contend with. Practice what you want to be good at, and you’re going to be okay. It got me thinking, in my most recent round of ‘what am I doing with my life?’, of all the different things that I’ve wanted to do with my life in the past, and how it’s turned out for me. Sometime early high school, I was one of those academically ambitious people. 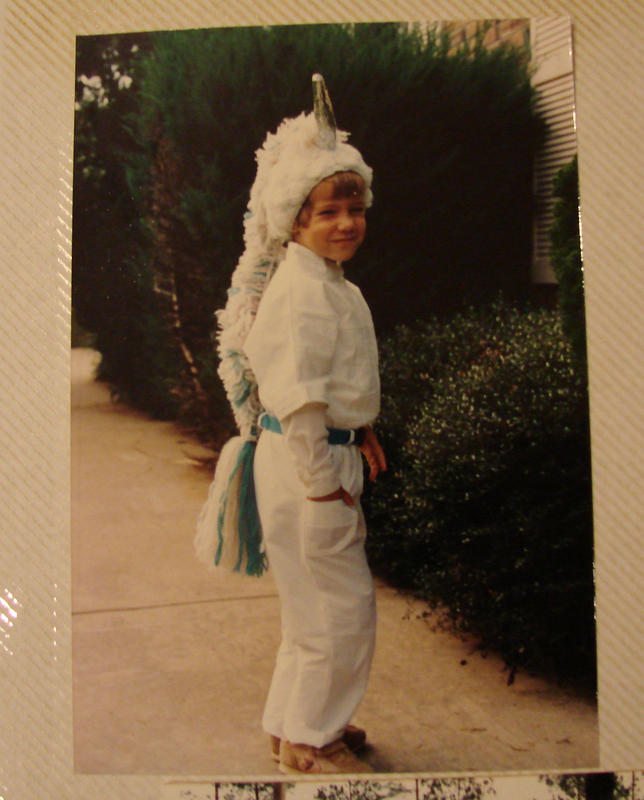 I think my parents had high hopes that I would stay on the straight-and-narrow, go to college, go straight to grad school, and emerge on the other end with a Ph.D. in some sort of science, preferably physics, though I’m fairly sure they would have been content with any ceremony where I’d get to wear that funny hat. Instead, I skipped out on my college graduation ceremony to ride my bike. During my swimming career in high school, I had high hopes someday going to the Olympics. It was definitely one of those goals I had since I can remember what the Olympics were and I still watch the Games every time I can. There’s something fascinating about watching the best in the world do what they do best. But then after realizing that I was an all around crappy swimmer, I got a bike to pursue the triathlon avenue. 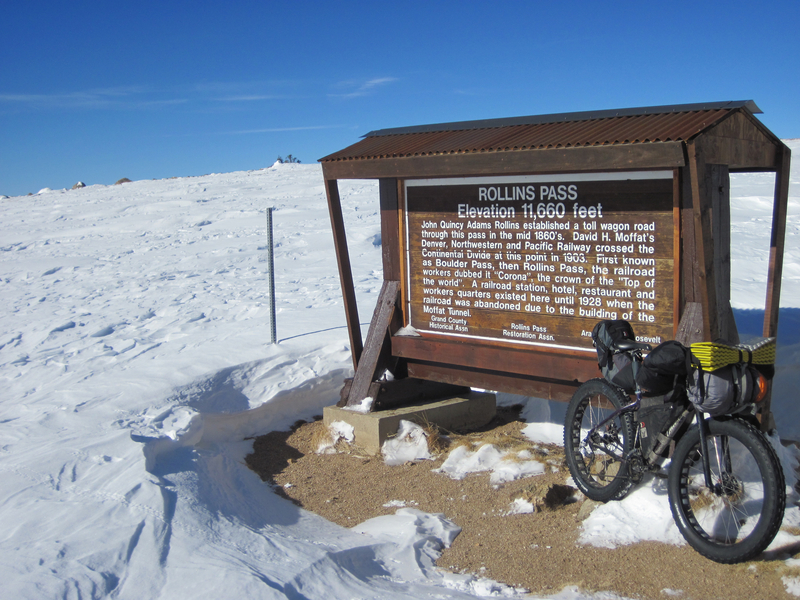 That quickly fell apart and instead of pursing a sport that could have landed me in the Olympics, I ended up riding my bike across the country. Somewhere in there, I wanted to be a swim coach. 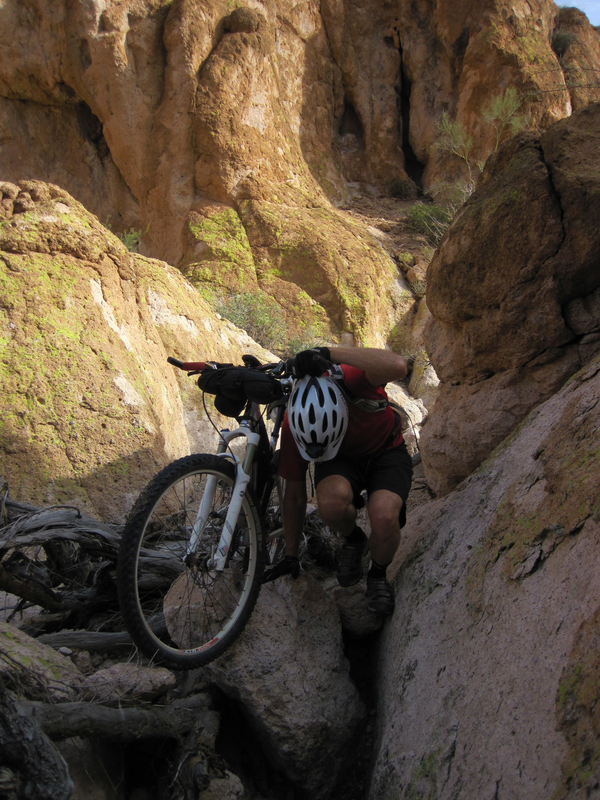 Instead, I ended up coaching the Western State mountain bike team for two falls. I loved it. Getting to coach was an amazingly gratifying experience and I’d love to be able to do something like that again. Losing that opportunity led to a much easier exit from the Valley for me, so in the end, I don’t regret it ending (or trying to fight for keeping it harder) either. I do miss riding my bike at Hartmans two evenings a week though. For the majority of my undergrad experience, I had every intention of going to grad school. Then I discovered the mountain bike team, and somewhere between surviving my first collegiate nationals XC race at Angel Fire, surviving enough shots of tequila to turn me off from that form of alcohol forever, and somehow getting my hungover self home, I was pretty much ruined. Mountain bikes were where it was at. Grad school could wait. Then I went through a bike messenger phase. Between getting to ride all day, go to the Mountain Sun far too many days after work, and living in the green Gillespie house, life was easy. Life was swell. Ambition was not at the top of my list. I got really good at trackstanding, weaving through traffic, and I know which grocery stores have the best samples, skills I still use on a daily basis. 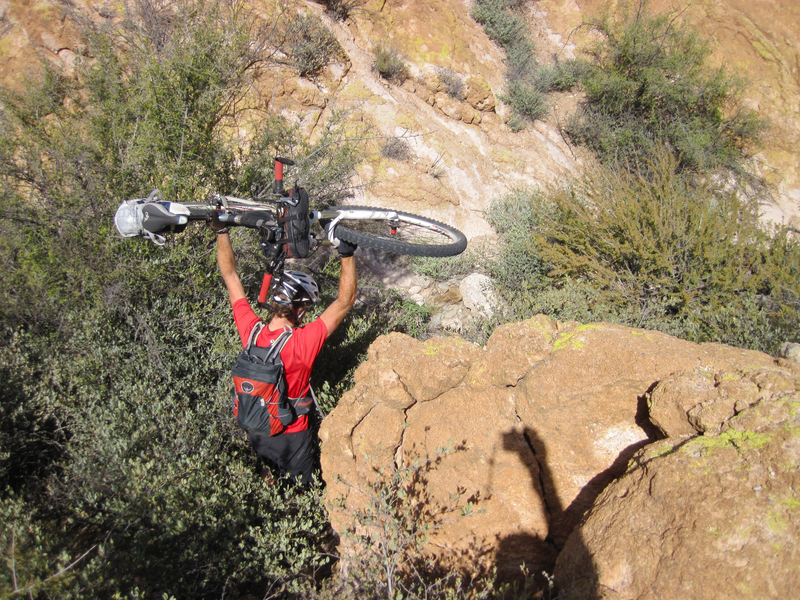 I still get a similar thrill maneuvering through traffic as I do riding singletrack, which is probably a bad thing. There’s a grace and art to it when done properly. Eventually, I got tired of not wanting to ride on the weekends and I started teaching for the physics department and immediately fell in love with it. So, spurred on with the promise that all I had to do was get a Ph.D. (trivial, as physicist would say) and I could teach at a college, have my summers off, live the good life, I went back to school. This one held so much promise…until I got bored. The Masters was a small consolation prize, but the big win was a cementing of realizing that I had zero desire to do research. Period. It bored me silly. The even bigger was that I rode by bike a ridiculous amount during that time. 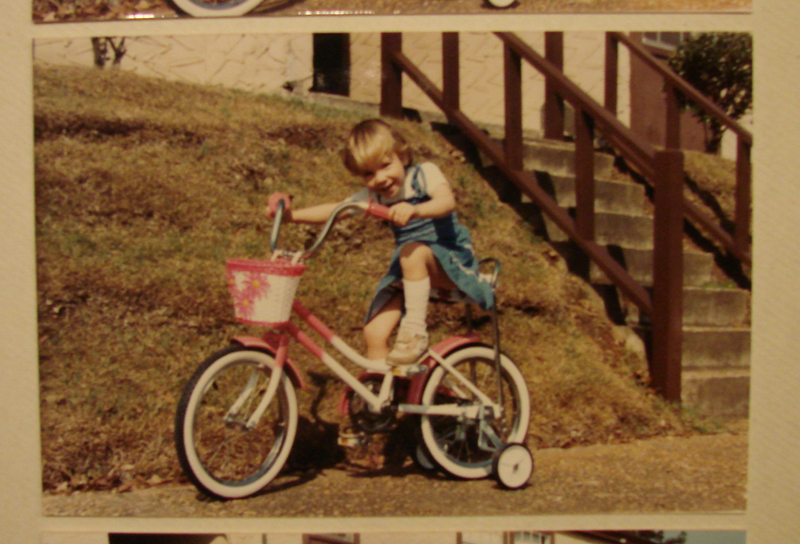 Riding bikes was far more fun that analyzing data. 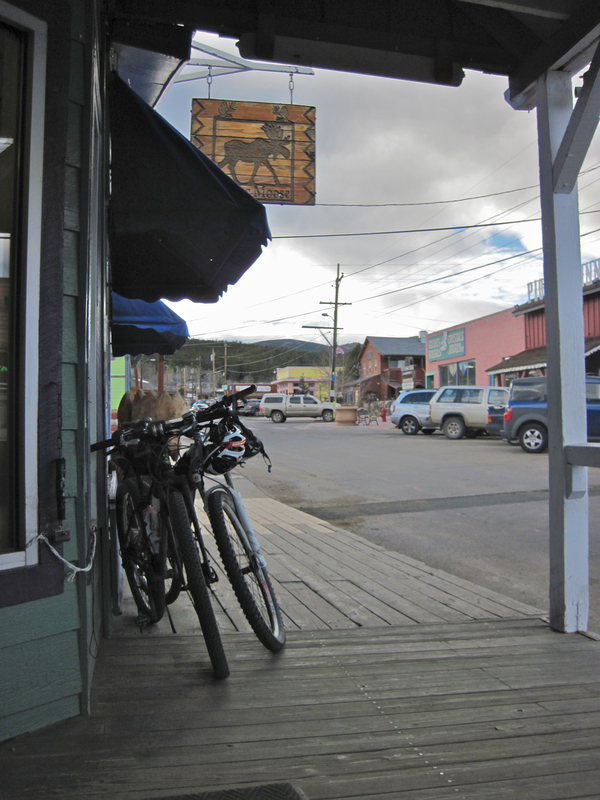 And so I went to Crested Butte for the sole purpose of riding bikes. Except that you can’t ride bikes there for a very large portion of the year, which was a bit of an eye-openning bummer. I didn’t really think that one through. But what this little exercise brought to light was that in the end, despite all of my best made plans and goals, all I want to do is ride my bike. Every venue that I’ve gone down has either led to riding bikes, or has left me bored stupid, half-assing whatever I was doing so that I could ride bikes. Maybe I should start listening. Maybe I really did have it figured out at 5 years old. I just want to ride my bike. I had a pretty good morning when I got out of bed today. I got up, put some bike shorts on, puttered around upstairs to find my headphones and bike shoes, cursed for a while when I could find neither, and eventually got on the trainer for Fat Kids Kamp trainer time and proceeded to daydream for 28 minutes. I walked my backyard hill in reverse today. It totally blew my mind. I then puttered upstairs to find that my brother had cooked up a breakfast of bacon, eggs, bell peppers, onions, and spinach (and I wonder why I have to go to Fat Kids Kamp), scooped a plateful of his concoction up, and sat down to peruse Facebook. Then there it was, a conversation between Drunk Cyclist and Devon: Riding in Iceland. When are we going? Holy cow, that would be soooooo cooooooool! *I* want to go ride in Iceland. And New Zealand. And Australia, and the Himalayas, and Patagonia, and Alaska, and Arizona, and New Mexico, and countless places in Colorado that I haven’t visited yet. Another corner of this fairy-land Universe. I’m setting a new life goal! I declared to the dogs (who, admittedly, didn’t really care). I want to ride in as many cool, new places as I can in this lifetime. And I want to eat good food while doing it! My first thought was ‘I need to get started. Right now!’ and then I reminded myself that in under six weeks, I would be riding in a cool (cold) new place so I should exercise a little restraint and get my life together for that first. And then I started pondering the feasibility of the life I wanted. I want to see new places, ride new trails, and search for Unicorn Dust. When I first came back to Boulder, in the midst of quite possibly the worst depression that I’d ever experienced (and I’ve gone through some pretty down periods in my life) I couldn’t answer the question of ‘If money was no object, what would you do with your life?’ I tried on all sorts of imaginary costumes, quite possibly the most absurd being looking into law school for patent law, simply because I was sick of being broke and their starting salaries are something like $125K per year. I had some other good ones, but in hindsight, that one makes me laugh the most. And then I slowly clawed myself out of the hole that I was in. 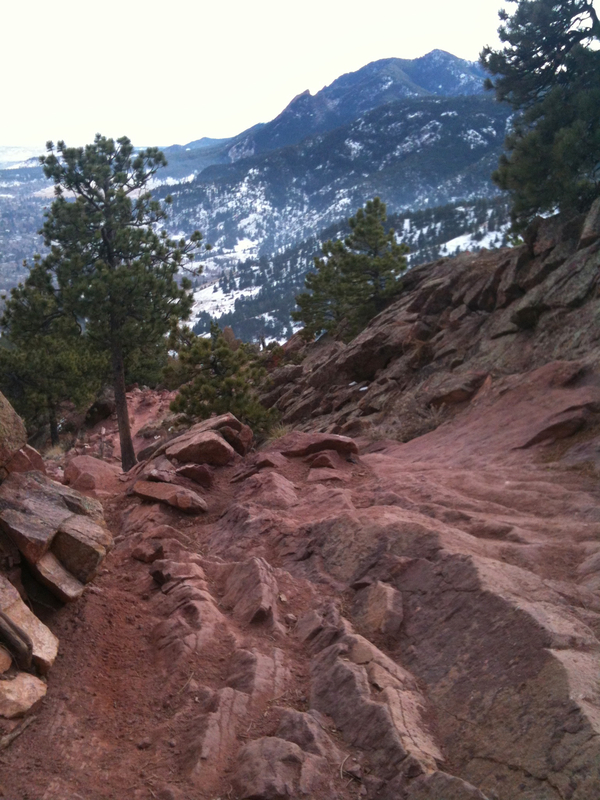 I slipped back down a couple of times, but eventually found myself again on steady ground, if on slightly shaky legs. I want to ride! I want to race! I want to travel! I want to write! I declared. I want to do the absurd, the silly, the unexpected. I want to participate fully in everything that life has to offer. You are not independently wealthy, my mom reminded me. But people do it! I’m surrounded by people following their dreams and ‘making it’. I see AmyH teaching yoga. I see EddieClark getting to follow the Tour Divide and take pictures. I see Mara getting to race her bike on her terms. I see Andras living at the Olympic Training Center while going back to get his MBA. I see Jill writing while adventuring. I see Walt building frames. I see Scott being completely mobile and playing in the desert in the winter and Colorado in the summer. All these people, doing what they love, doing life…creatively. And they make it work. There’s a code to it. I need to crack this code. How do I travel, ride, write, and seek happiness all over the world, sustainably? I need to figure this out before I get suckered into a real job.